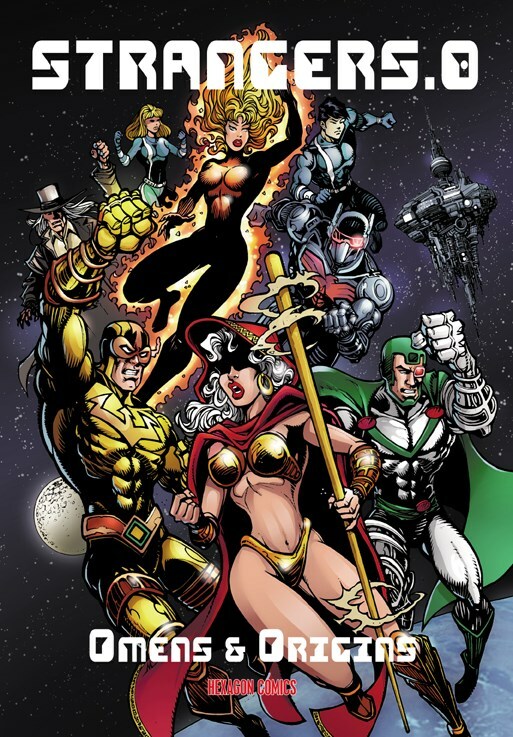 STRANGERS 0: OMENS & ORIGINS by Jean-Marc & Randy Lofficier and JM Arden, Luciano Bernasconi, JJ Dzialowski, Chris Malgrain, Reed Man, Svart, cover by Alfredo Macall. Was the Bronze Gladiator deliberately drawn to Earth to fight Wampus? How did Tanka come to inherit the powers of an Invariant? What are the origins of the mysterious Futura? What terrible danger did Frank Universal and Sally Swift face in the Necromancerâ€™s castle? And how did Starlock free himself from the evil clutches of S.P.I.D.E.R.? The seven stories collected in this volume are more than mere prologues, but form an integral part of the vast space-time saga of the STRANGERS, revealing for the first time the secrets that led to the formation of the strangest superhero group of all time.